MemorialMoments.org Having trouble viewing this email? A good work disappears when it appears. A good work appears when it disappears. A good work is no longer a good work when we "out" it, by telling people about it. When we seek to receive honor and glory among people with our "good" works, then they are no longer good, but evil. Our works are truly good when they are done in faith, for the benefit of the neighbor according to the Ten Commandments. As I mature as a pastor, I increasingly have people express their appreciation for something they say I had said to them, proclaimed in a sermon, or something I had done for them in a moment of crisis. Most often I can only smile and express appreciation for their recollection. I seldom let them know that I have no recollection of what I said, preached, or did that they particularly remember. I am amazed when people are able to quote the sermon I preached six weeks ago, when I have no memory of having preached it at all. Maybe this is well; I prefer not to let my left hand know what my right hand is doing (Mt 6:3). If I am forgetful this is much easier in practice! Self-consideration and self-regarding are damaging to our focus on the work of God. There is no reason I should remember what others find helpful or spiritually uplifting, because it is God's business under the theology of the cross and He can take care of it. Where our hearts are set on God and His treasures, our works are considered by Him to be good. If our hearts are set on praise in this world, then our works become evil. Our works must remain under the cross, only under that shadow will they be considered truly good and under that shadow they will always remain hidden from the world. Good works appear when they disappear. "Whoever wants to be a Christian must make up his mind neither to undertake nor to discontinue any good work on the basis of what other people think, but only as a means of serving God through his office or station, his money or goods, or whatever other possessions or abilities he may have, doing what he can to God's glory although he may never merit any thanks for it on earth at all. "It is impossible for a pious man to be adequately rewarded here even for the very smallest work that he does; even being crowned with gold and receiving an entire kingdom would not be enough. Therefore he should limit his ambition to getting what he needs to eat and drink in exchange for his work, expecting no reward from the world. The world is unworthy to repay or reward a good work, or even to recognize and honor a real Christian; even if it knows him, it is not pious enough to thank him. Now, since his work is not undertaken for the world's sake, it should not be discontinued for its sake either; but it should be commended to God. He will reward it profusely, not in secret but in public, in the presence of the whole world and all the angels (Mt 25:31-40). "Where this insight and understanding is absent, there no really good works are possible. Instead, a person becomes impatient, disturbs his own peace, and lets himself be overcome by the shameful ingratitude of the world. Thus this good work is destroyed and disappears, appears. It becomes clear that he was doing it not out of regard for God but out of regard for people. For that matter, if I had not known this, I would have given the world its walking papers long ago and let it go to the devil rather than to let it hear a single word from me. But the important thing here is not the world, but our dear Father in heaven. Because of our love for Him and because of His glory and honor we shall preach and do good. The rest of the world hates Him, it shamefully despises and blasphemes Him, and it does everything possible to oppose Him and vex Him. We console ourselves with the fact that He still lives even when the whole world is destroyed; since He has declared and promised that He will duly reward and repay, He will not lie to us. So try it, and you will find that it will not fail you. Let this be a general introduction on what attitude a Christian ought to have in his heart toward charity and all other good works." 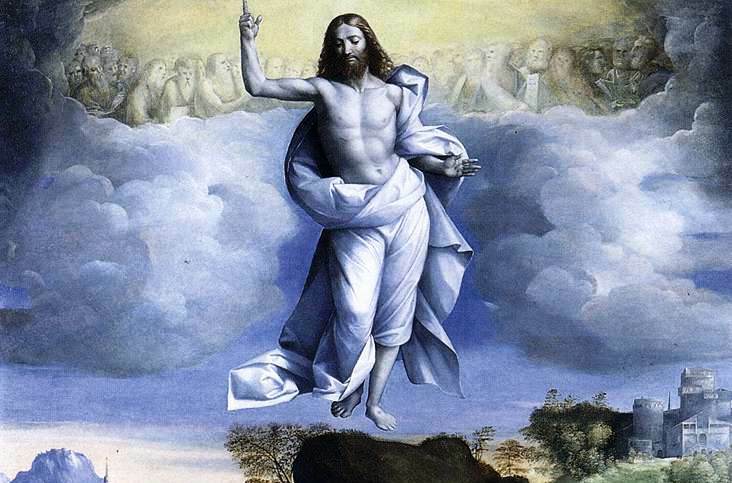 Almighty God, as Your only-begotten Son, our Lord Jesus Christ, ascended into the heavens, so may we also ascend in heart and mind and continually dwell there with Him, who lives and reigns with You and the Holy Spirit, one God, now and forever. Amen.